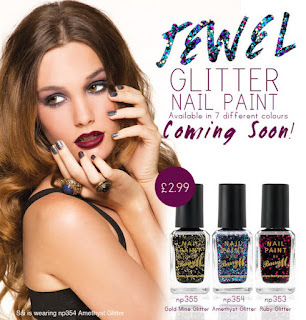 So this has got me seriously excited, I saw Barry M tweet about two new collections and so I checked them out and I cannot wait to get my hands on them! First up is the Jewel collection which comes out in stores on the 26th September..
Ahhhhh I can't wait to get my hands on this! I will be in Boots ASAP when these come out! So when I saw this advert I was interested but to be honest you can't see how they look on and the colours don't look very interesting, however I then googled it and found images from people that have tested them and they are sooo nice! WOWOW how amazing are these! 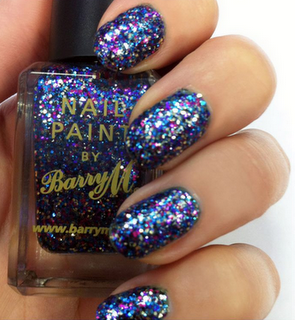 SO shiny and really do look like gel nails and the colours are absolutely gorgeous! I'm loving the darker colours for winter :) These come out in Superdrug on the 26th September and Boots on the 3rd October, do I really have to wait this long! :( Thinking of October, may have to have the top middle or top right colours for Halloweeen! I just had to post about these as soon as I could as I'm rather excited (yes, I am sad) especially the gelly ones! Which ones will you be looking to try out?